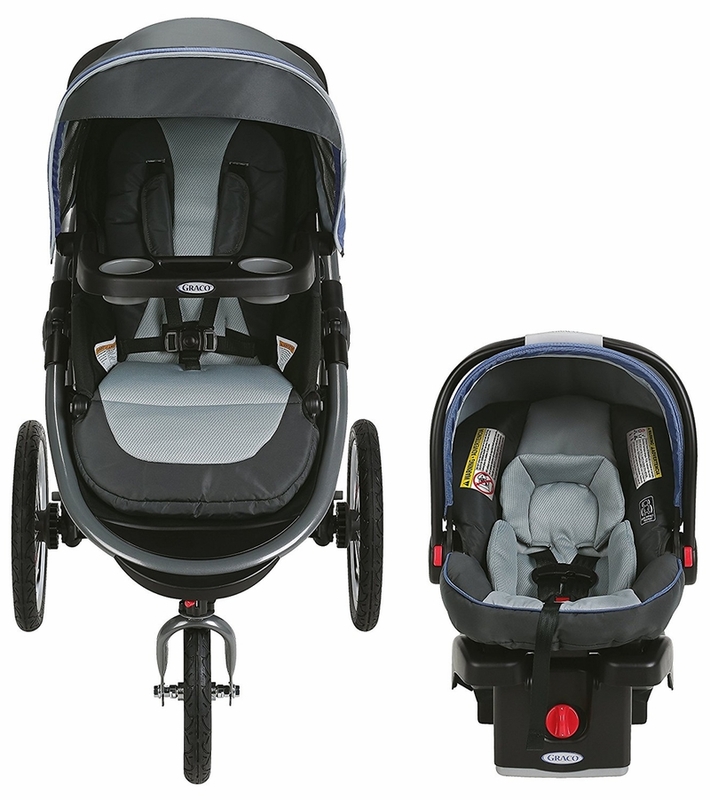 Graco's Modes� Jogger Travel System gives you 5 ways to ride, plus everything you need to jog, with the top-rated SnugRide� 35 infant car seat. 5 ways to ride includes infant car seat facing parent or the world, stroller seat facing parent or the world, or traditional travel system. 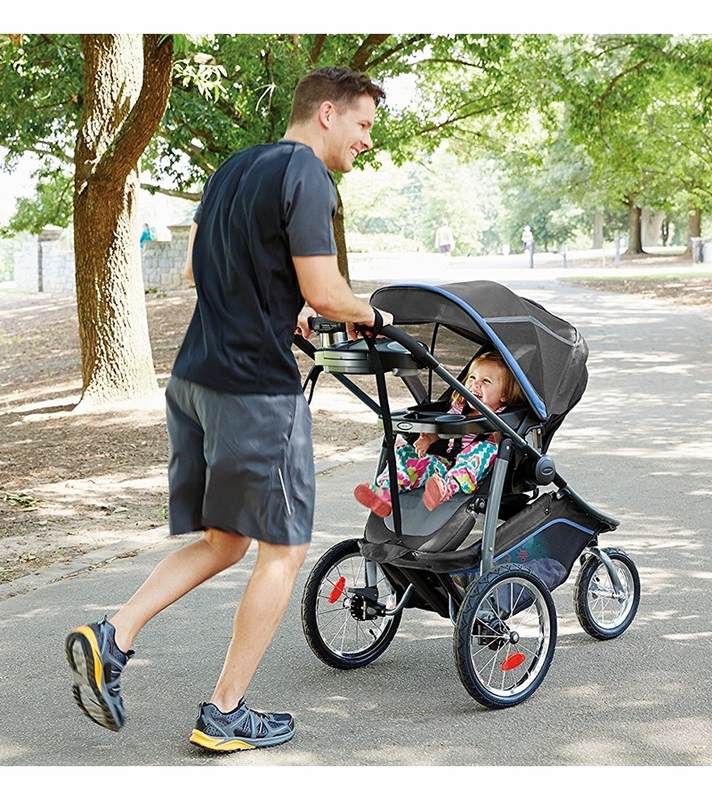 You'll have everything you need to jog while little one is nicely shaded with the extra large UV50 rated canopy with breathable mesh. Little conveniences like cup holders for both you and child, and smartphone storage, make this jogger comfy and smart! One-hand, standing fold makes travel with baby easy. I got this as a gift from my parents. I was very excited at first since I heard a lot of great things about Graco and their travel systems but honest grew to dislike the product. First, it's not as easy to work with one hand. When closing, I have trouble with it snapping on me and I always need to remove the toddler seat just to close the jogger or it will get stuck. The product is really heavy as a well and takes up my whole trunk ( I have a Prius) along with most of my mother's SUV trunk. Lastly, from the beginning, I always have trouble pushing and turn the jogger. The front wheel is always getting stuck so more often then I would like I would need to pull it on its back wheels to turn it left or right. I received this as a baby shower gift for my son who is 8 months old. The fabric cover is literally falling apart. I patched the first hole but three more have shown up. Three along the back seem and one along the seem where his leg lays. It's like the seems weren't sewn together very well. Poor craftsmanship to say the least. And we have the same wheel issue on the front wheel. It locks up sometimes when we try to turn it. I bought it for my first baby,I know graco is known for great things so I went and got this stroller. I thought I would love all the futures it had but it was definitely the worst purchase I could of made. The front tire always gets stuck and I feel it really has a mind of it's it own. For as much as this stroller cost I would imagine it was a good one. Sadly I bought it before my son was born so by the time I used it I could not longer return it. 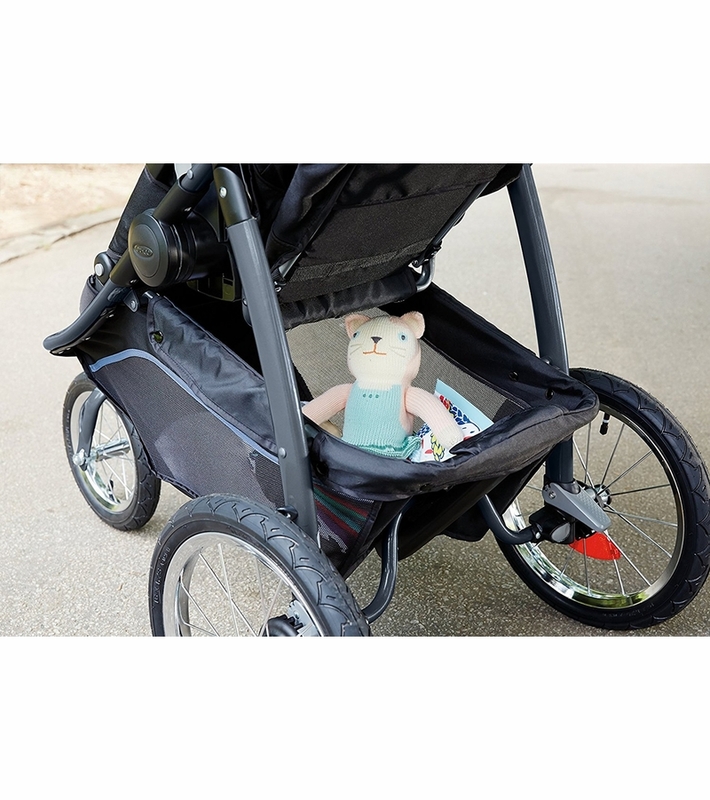 I am usually not someone who writes bad reviews and always tries to find the silver lining but this item was not worth the money because it is supposed to last for a long time and as a jogging stroller you would expect the handling of the stroller to be spot on. Ever since we first started using the stroller portion is has never steered correctly, even after having the tire pressure checked it just always wants to go to the left and physically takes both hands to even make it go straight even when the front wheel is unlocked. If you want a stroller that is easy to control and makes shopping and jogging easier this is not the combo for you. However, the car seat has been amazing! Love the look... front wheel is terrible! Can't even walk with it. We have everything graco but this was the worst purchase! I bought it for myself and we took it on vacation instead of our regular bigger graco stroller and it was so hard to stear the wheel kept locking and getting stuck and the tray was broken right out of the box! So disappointed! My in laws bought us this unit 9 months ago. I hate it! The front wheel constantly get stuck sideways and i have to go turn it straight. If I run over a twig or a clump of anything it pulls the stroller in that direction and I have to fight with both hands to steer is straight. If I have the front tire locking mechanism on to keep it straight I cant even turn slightly. This stroller is more of a hassle than anything. I originally received this as a shower gift and loved the idea of all the different positions, but I'm not sure if it's worth it. I'm not usually one for reviews, but I'm starting to get tired of it. The stroller is bulky - I have a small SUV, and it takes up most of the trunk.It is also heavy (which doesn't bother much, but my mother has a hard time using it). Folding it so it doesn't fall over takes some practice - especially if you're trying to do it with one hand. Unfolding it is even more difficult - I don't recommend doing it with anything in your other hand just in case it goes rogue and you need to catch it (which I've had happen many times...then I feel awkward as everyone watches me fail at using my own stroller). The front wheel was also a problem, but we put some WD40 on it and haven't had any more issues with sticking(yay!). I also wish the visor came down farther like other joggers (such as the Baby Jogger) - even with it all the way extended my son gets sun in his eyes. My final straw with the stroller (and possibly Graco) was when we took it on the plane and the visor was bent - not Graco's fault. However, when I went to buy a replacement part, there was not one part available. This stroller is only a little over a year old AND they still sell it. Very disappointed with that. Some pros of the stroller: I do like that I can face my son toward me if he's napping or if it's windy. There is a ton of storage which is a necessity for me - the basket is huge and I love the storage compartment on the parent console. It also has a nice smooth ride and my son always seems comfortable; it 'off-roads' pretty well too. We recently took it on the beach and it surprised me with the handling. Finally, the way it reclines is very nice - you can go to pretty much any position you like and it isn't difficult to do. was a baby shower gift from my mother in law and for $350, it's highly disappointing. I bought it 1 year ago when I was expecting my first baby. So far, we've been used it for about 7 months and for us this is a great product. 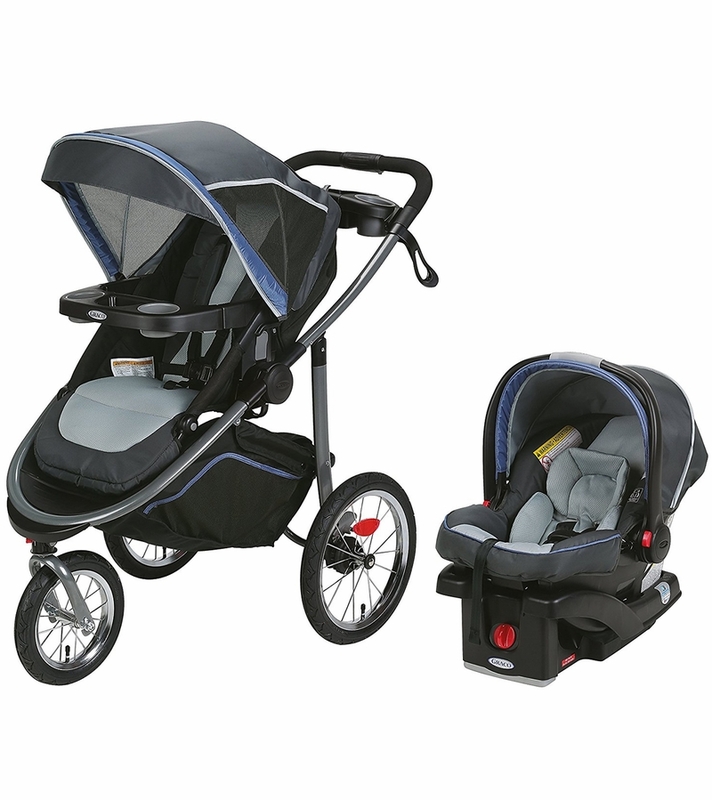 Easy to get your baby in and out for both, car seat and stroller. Sometimes I feel the car seat is kind of heavy, so depending on how your child grows, you won't car him in the car seat. Another thing I would say is about the size of stroller. Even if you flowd it, to care it around or even getting in and out of your car is kind of difficult, it's heavy and a little bit bigger. If you are looking for something small and light, this one is not going to be a good option, specially if you travel a lot. I have been using this stroller for the past two months with my newborn and as stated with other reviewers, the front wheel continuously locks making steering extremely difficult. I bought this travel system with the hopes that I would have an easy to use and maneuver stroller, however i have been disappointed with the product. Is there any way to fix this issue? I bought this a couple of months ago before my son was born. The stroller is great for tall people. I'm 5'9 and my husband is 6'4 and we can push the stroller comfortably. It's also nice with the click connect system I can switch around the car seat and the bass with other click connect models and it will work. The wheels are great if you have to do a little off roading in some grass and it maneuvers great. I can do a 180 in place easily. My only problem with it, even with it fold down, it's a little difficult getting it into the trunk of my little car and have to maneuver it to make it fit. But I'll soon upgrade to an SUV and that will be solved. The click connect system is so nice! I love hearing my daughter is secure with a click. The front wheel sometimes gets stuck but otherwise its been great. Was able to get a replacement tire cheap on the bravo site as well when our tire popped running over a clothing security tag at the store. The first 3 months of using this product was great, but after that, the wheels keeps locking up on it's own. I was taking my 4 months old daughter for a stroll and ran into a father of a little boy who has the same item and he experienced the same faith as me. He even asked me if I had any issues with the product because he's already dealing with similar issues as me. I bought last year. have maybe used it 3 times. lots of space but very big, bulky, and heavy. barley fits in the back of my SUV. unable to be used as a jogging stroller because it tens to steer to one side and it is very heavy and not very maneuverable. I bought this travel system 1 month ago, I really love it! It is so useful and it easy to go anywhere. I got this stroller as a shower gift and it was pretty convenient with the car seat but now that we've moved to a convertible car seat I am ready to leave this stroller behind. The front wheel locks up ALL THE TIME. I get so frustrated trying to maneuver the stroller on turns as well as just going straight because the wheel randomly locks up. Originally thought it was a great idea to get a jogging stroller for around the neighborhood but once we get going, it we stop it just seems to be such a pain to get going again. Also is a very large stroller, takes up the whole trunk of an equinox having to remove wheels when putting it in my husbands malibu trunk. Currently on the search for a more convenient and working stroller. FTM and I have always heard great things about the Graco Travel Systems so when we were looking around it was a no brainer. I loved the idea of the Modes because of the multiple ways to use the seat - the 'big kid' seat comes out which makes the stroller slightly more compact and faces both ways which is great. Unfortunately, the front wheel ALWAYS STICKS and it drives me nuts trying to navigate out in stores. My husband wants to use the stroller for jogging when LO is big enough but it's such a pain to maneuver I don't know if that's going to happen. The system was expensive and I was hoping it would be much smoother :(. We do love the click and connect convenience though. Also kind of wishing I'd waited around for the SnugLock version as the base seems much easier to install and take out than the standard click and connect one. I've been using this stroller for about 9 months now. The car seat is heavy and the insert didn't seem to snugly fit a newborn baby but it works. The stroller itself is extremely frustrating. The front wheel is constantly getting stuck and it seems to have a mind of it's own. The folding of the stroller is very easy, however, after being used for a few months it doesnt always want to lock readily. 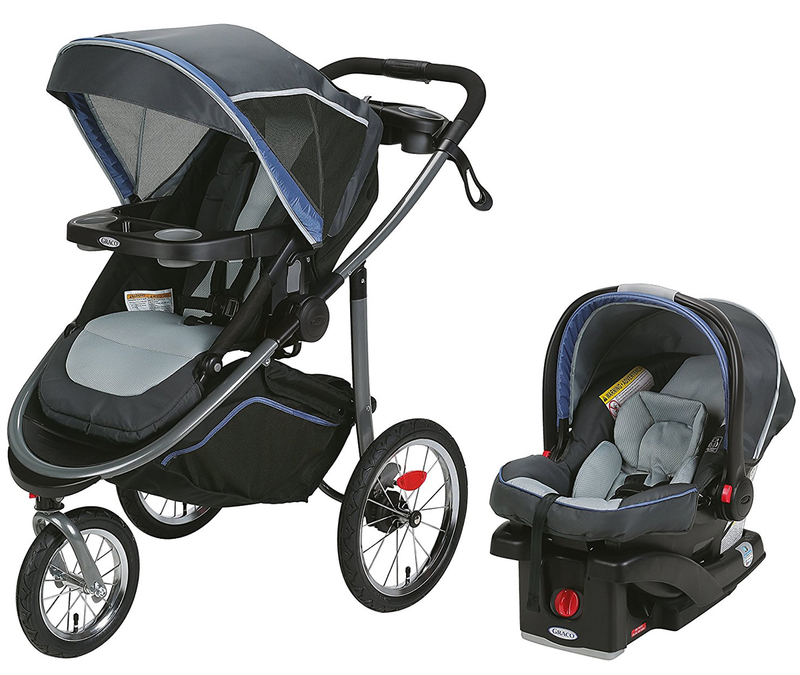 I initially purchased this stroller because I thought I could use it as a jogger AND an everyday stroller. 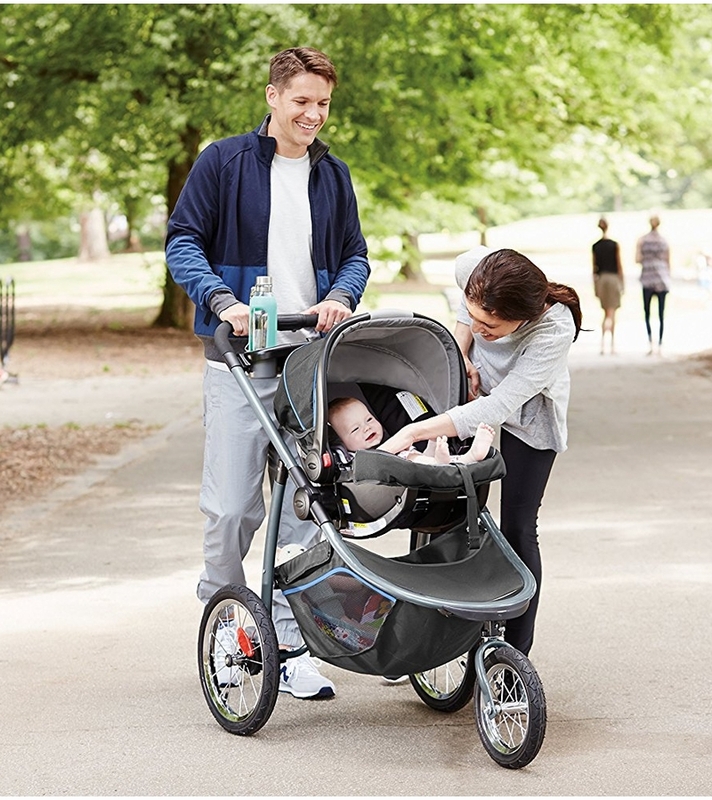 I never even jogged with the stroller (only walked) and it is extremely bulky for every day use. If I could go back and choose a different stroller I would. Please dont make the mistake I did and think you can get 2 for 1 use out of this item. This would be a great stroller if the wheel wasn't always locking up. I have had the stroller less than a year and the problem has just gotten worse and worse. Are these wheel under warranty? I love the car seat but the stroller wheels have given me nothing but trouble. I bought this last year when i had my baby....and now i bought it for my niece coming soon! 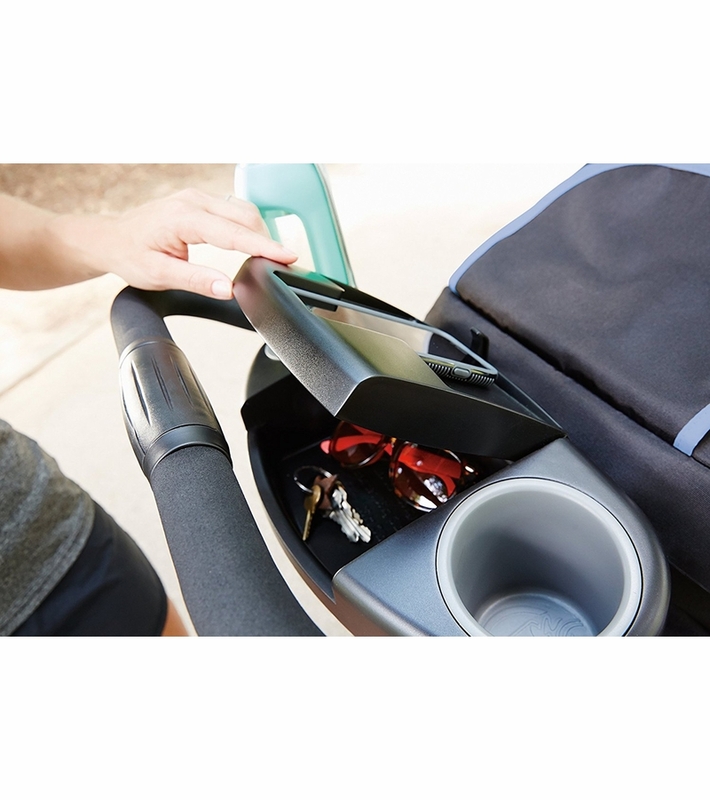 It is the most convenient stroller and car seat that inter lock with each other....which makes shopping going for walks, or jogging way better! We got this as a gift for our shower but now that it's in use we are going crazy because of the front wheel getting stuck! Everything about the stroller has been great and we use it often but trying to get through a store or anywhere without the wheel being a pain is very frustrating! i thought maybe because he was still small and with less weight but now that he's heavier it's still getting stuck and I can't walk a straight line even! After reading reviews it seems I'm not the only one with this issue..
We loved the stroller jogger but I am not that impressed with the car seat. I think its a great car seat and stroller. Clicks in and put of the car easily and the stroller. Love that I dont gave to fight with the strap to strap it into a car. The only down side I find is the stroller doesnt sit the baby up forward enough when you pull it put of the lay down position. It's just a smidge too far back. My kid likes to sit straight up and the slight leaning back he didnt like. And the seat for the stroller is bulky to bring places like the mall where you drive to walk with it. Some things are great about it, such as the ability to fold and open with ease. I have found a couple major flaws, which make me regret this purchase however. The first is the front wheel lock, which make the wheel only go straight and not swivel. It randomly will lock itself, which is a big pain to constantly have to fix it. Also, the kickstand does not always support the stroller and sometimes it flops over after it is folded. Overall, I am disappointed with this purchase. Got this as a gift from a baby shower. The front wheel of the stroller is awful!! You can be pushing the stroller and all of a sudden veers in another direction or better yet turn the stroller the to front wheel gets stuck side ways so you can't move the stroller until you come around to the front to straighten it out. I feel like the red lock on the front does absolutely nothing. It's embarrassing to use when you are out and all of a sudden the stroller is acting up. Very frustrating. I DO NOT Recommend. The car seat and base are good. Easy to transfer baby to stroller from car and vice versa just the stroller is not worth it. I bought this while I was pregnant like a month before my January baby was born. And I regret it. I actively avoid using this stroller because the front wheel is ridiculous it won't turn, or when it does it spins in directions you dont want it to go, then the wheel locks up and when you do choose to leave it locked you can't turn at all which is important to do. Very disappointed in this stroller especially with the amount of money I paid for this. Exactly as expected! Our daughter researched strollers and this is the one she wanted. My uncle and aunt bought it for us from our registry. The front lock part constantly got stuck. Also the infant seat option was great...however, when my son out grew the infant seat I put the toddler seat on and I never knew that it doesn't collapse with the toddler seat on there so it takes up soooo much space in our trunk because it is two separate pieces...traveling with it in the airport is a complete hassle. I'm thinking of just getting a better stroller that does collapse and is easier for travel. I really wished I would have never picked this one out in the first place...for the price of it, it should not have these problems. I really like it for the multiple direction options with both the toddler seat and the infant seat but the front wheel gets stuck ALL THE TIME. It is very hard to steer. I read reviews about it, and decided to still go ahead and buy it. I shouldn't have. Its too bulky, and every time I try to fold it, I definitely can not do it with only one hand because its heavy and the front wheel just won't let you. It's annoying and stressing when you are on your own with your little one. It's not easy to walk with because the front wheel does lock from time to time which it's stupid. As a family this stroller has everything we need! The "grow with me" concept works as expected and fits our needs perfectly. That said, I cant give this a high review. With only a couple of uses a "wobble" developed with the front wheel making it impossible to run or walk fast with. Also while using the toddler attachment the stroller becomes incredibly heavy when folding up and trying to move it. So much so, that we need to disassemble the top piece as my wife cannot move it. This is my second review, not sure why the first one was forcefully removed. Bought it awhile back for my grandchild and we've been using it for my great nephew! He loves it! We have an older model to and prefer the newer! Wish I could find the older model with the newer models phone/ cup holder on the handle! Older model doesn't hold the iPhone pluses like the new does! My son has been practicing walking with the stroller with their little morkie puppy! We got this as a gift for for our first born and we loved it! So light weight, easy to fold up, and overall a great product for the price compared to other travel systems! Received this as a shower gift and have used it for the last month. It pulls to the right ALL the time. I capush the stroller without counter pulling to go straight. Thid happens no matter the air pressurr in the tires or surface. Its so disappointing after months of research and to have so many problems with it. I wish I had read the reviews before purchasing. The front wheel keeps locking and it is extremely aggravating, especially if you are in a crowded mall or store. I would absolutely love it otherwise, but because of the wheel locking I dread having to use it. I love the jogger! It's so easy to open and close. We've been using it for our 2 yos while we wait for his baby brother to be born! Cant wait to use the car seat with the jogger! The system itself works well with the click connect. There are many great options on how the baby can be positioned and my child does seem comfortable and enjoys the ride until the front wheel locks up, which happens a lot. I'm hoping to try the Remix for a lighter smoother ride. So i bought this thinking i would use it for running like other reviews but the wheels constantly gets stuck and now my front and one back tire keeps going flat. My husband ended buying a cheaper stroller when we go out so i still have mine in my car if i ever need it. Just disappointed that we spent over 300 bucks and have barely used it. The stroller use to be amazing and easy to steer. However, recently the right wheel Kees locking, making pushing and steering extremely difficult. I got this as a baby shower gift and I am extremely disappointed that my aunt wasted her money. The front wheel locks and becomes very difficult to maneuver. I splurged with this purchase and wish so badly I hadn't. bigIt's big, bulky and so hard to open and close. The tray is scratched up so bad from it collapsing on itself and if you don't have the wheel in the exact right angle it will not close completely. Trying to steer it is another nightmare all in itself. There is no control and it refuses to go the direction you try to steer it in. If I had the money I would throw it in the trash and buy something else but I don't do I'm stuck with it. Love the different options and ease of use. Would have given 5 stars but the stroller is quite heavy. the car seat to use up to how many pounds and how many centimeters the baby measures. Does it include the base to use the seat in a car? Yes, the base is included. Does this include the base of the carseat so the seat may be used in a vehicle?